Something to blog about that is NOT Earth Day... on this day in 1864, Congress authorized the use of the phrase "In God We Trust" on coins. You are probably a Christian. What if our Republic were not shattered beyond reconstruction? Would not the antiquaries of succeeding centuries rightly reason from our past that we were a heathen nation? This was apparently a compelling argument to Secretary Chase. After it was determined that neither the Secretary of the Treasury nor the Director of the Mint could make changes to the coinage (such as adding a motto) without Congressional approval, it is presumed that some lobby worked for passage of new legislation. 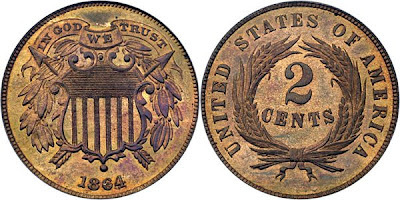 On April 22, 1864, Congress passed the Coinage Act which, among other things, allowed for the placing of "In God We Trust" on the one and two-cent coins. A number of other laws were passed in later years that added the motto to other currency, and in 1956 President Truman signed the bill making it the official national motto. A year later it appeared on paper money. Ah, if only the historians of the future could, in fact "rightly reason from our past that we were a heathen nation." As it stands, there will be no mistaking how far America has fallen into religiosity from the days of the founding of the nation. I was passed an email from my brother (all up in arms!?) last month about the post office handing back gold coins without "In God We Trust" on them. It was a all for naught - the motto is on the edge of the coin. I haven't seen them in person, yet, but they look cool in the picture. My two cents: I agree with Mrs. August (and Rational Jenn's great advice)about the Earth Day thing - it's just doesn't seem to be too much of an issue around here (except historically as the grandfather of environmental activism). But, your post yesterday turned into an excellent discussion about personal experiences with indoctrination in public and private schools and how to combat it at home. How about some more of that? As I was looking around for photos of the 1864 two cent piece, I found out that the most recent Washington dollar coins had a run of 50,000 misprints (or no prints) last year where that batch was missing the "In God We Trust" edge writing. They're still in circulation, though they are also instant collector's items and are being snapped up whenever people notice them. And yeah, the post about school and helping children deal with the big issues (good and bad) in school turned out really well. It seems like that type of lively discussion happens only once every couple of weeks, and seems to be on a random assortment of topics. It's nice when it happens, but I have yet to find rhyme or reason why some posts generate a ton of interest and others don't. Perhaps it's because the blog covers so many topics? I wonder if a more focused blog like Burgess Laughlin's generates more consistent discussion. I think your blog is great. I just started too - was it last month or February? I did have a few posts dated last year, but I shared it with no one until a few months ago. I'm finding that I have less to talk about than I thought I would, which is quite an odd discovery for me. If I limited the scope of my blog, I'd have even less to post on. As it is, I think I'm pretty much sanitizing my quirky personality - and without the quirks - I got nuthin'! And everything is coming out kind of whiney - I hate whiney. Comments are always helpful even if they tend to get off-track of the original subject. I need to remember that because often I won't comment on someone else's blog because I think it'll be too off the point (not something I'm suffering from tonight, clearly). Sometimes comments blossom into something great. I'm going to try to comment more. And while I'm rambling off topic - I just started the first Sparrowhawk and I love it. (I haven't pressed the "order" button on the Baroque Trilogy or Katherine, but they're in my Amazon cart when I'm ready - I had Sparrowhawk). And, I'm with Rational Jenn in that I loved Gone with the Wind - so much better than the movie which I also loved. Just reading other people's blogs is a full-time effort! Nothing happens during 90% of a baseball game, so why don't you sit with a loptop? Kidding. I agree that a narrowly focused blog might be harder to write for (at least write often, anyway). Though issue-driven ones like WeStandFIRM (I don't have the link right now) that deals with healthcare has a lot of activity. I personally prefer to read blogs that are more general-interest like Gus Van Horn, where you could see his thoughts on anything day to day, but where there are also some common themes that weave in an out over time. You say you are "sanitizing [your] quirky personality." Why? If that's how you write and what you enjoy, why limit it? Flibbertigibbet is pretty darn quirky and seems to be quite successful. Lately I've been more busy in general and have had less time to write. I also spent a lot of time last week preparing a multi-part post that I ended up scrapping because as I got deeper into my research, I realized the main point I was trying to proove was wrong. That was frustrating. But overall, blogging has been very rewarding and I've learned a lot doing it. I'm interested to see how it evolves. LB, I forgot to include a link that you may have already seen, but is worth a second look regardless. Gus Van Horn put together a great detailed post about blogging, from its use in intellectual activism to technical strategies to ways to increase traffic and even how to pick topics and find time to write. At RationalJenn's suggestion, I read it before I decided to start blogging, and it helped a ton. I think, now that I have some limited experience under my belt, I'll read it again. Yes - I read GVH's post on blogging and activism before actually posting my name and blog anywhere (and RationalJenn's and Spark A Synapse's and Noodlefood's similar pieces) and the various responses. I have it under my favorites and do read it from time to time. (I'll read it again next, in fact.) Actually, somewhere you wrote or commented that you were keeping a list of what to write about based on Jenn's recommendation. I started that too. It's all good advice. I have had the same experience with starting to write something only to find out that my entire point amounted to nothing (notice there was no follow up post to Join or Die). But that's an excellent way to learn stuff (though frustrating). As the ultimate modern couple (or so we like to think), SB and I often cradle our dueling laptops during the games but find the broken concentration only good for reading a few sentences here and there, and just plain counterproductive to writing.